Thanks for Freshly Pressing me again!! And again! Thank you to all who follow and support me!! It is dark as I walk up the hill to my car. The little store is secure and dimmed for the night. My drive home is more cautious. Headlights pick up the occasional glow of eyes along the stone walls. The deer and moose rut season is upon us and the animals are moving, losing sight of the dangers roadways pose as they seek a mate. Solitude with friends. I gather a bundle of kindling and set about the fire. Newspaper is skillfully twisted in bow-ties, as my father taught me. Cardboard is carefully place and kindling is positioned. A single match sets it ablaze. The crackle and aroma fill the room. No words are forthcoming. I set the music low, a cello solo that is so familiar it is wall-paper to my thoughts. Dinner preparations, a chilled glass of wine, I traverse a familiar routine that calms and carries me deeper into my head. Animals crowd around when I finally sit to watch the flames and eat. Do humans have a season of rut? Why do deer mate right before the harshest weather sets in? Both times I was pregnant it was winter. I didn’t live outside but it was still not easy to navigate life amid snow and ice. This? This is what I am, who I am, what I have built. Leave and pursue your dream of nirvana? I stop and brush aside the feeling of warmth, of being wanted – needed perhaps. Ah, it is the being needed to complete his vision of happiness that is a thorn. Wait while I digest this fact. There is no mate in my world at the moment, but that doesn’t worry me. Let the deer and the moose have their season. 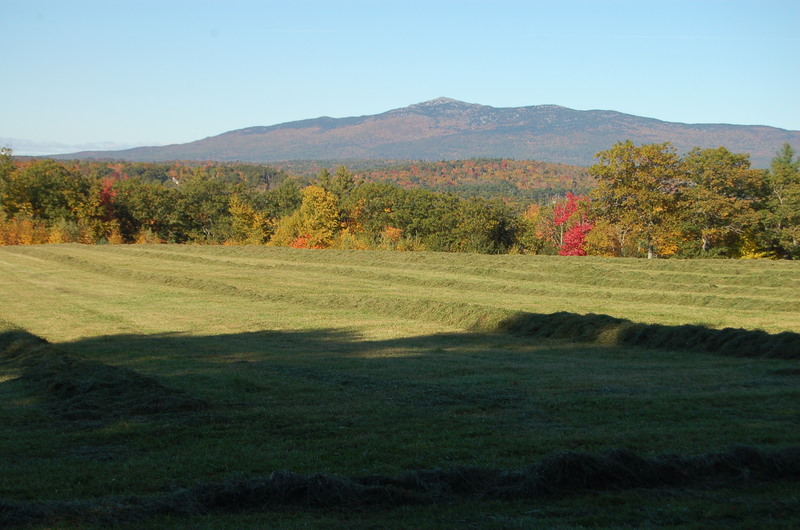 Mount Monadnock – The Mountain That Stands Alone.. This entry was posted in memoir. Tagged blogging, creative writing, deer, Moose, Mount Monadnock, New Hampshire, relationships, rut season. Next Post Next post: Balsamico! Thanks Doppleganger. It was really good looking late cut hay! As to the rituals of life, they could be seen as dull routines with the wrong attitude, right? “Leave and pursue your dream of nirvana?” This is surely one of the hardest things to do. Thanks Hassang66 for dropping by and commenting. Everyone’s vision of Nirvana is different and not necessarily inclusive of others! You are right. Sometimes living one’s own Nirvana is difficult. You sound centered and solid. Thanks Phil for checking in…always good to hear from you! I wonder what makes old lover’s think rekindling a relationship after years will bring back the spark which set the blaze to begin with. There are always reasons the past is the past – it is where is belongs. Other than the intruding phone, it sounded like a very peaceful evening. You are wanted, needed and loved by those around you! Loved this Martha – my favorite post thus far. I connected on several levels here and actually felt a chill and a lump in my throat while I read. GREAT post. You know who you are and I wish you all the very best. You deserve only that! Thanks Julie, humbled by your comments. I would like to think that most of the time I do know who I am and that most of the time I am a very lucky girl!! I really miss a good wood fire, especially when I read about yours. Deer mate at this time of year so the fawns will be born in late spring when there is plenty of food and cover. My wife spent a long hot summer pregnant with my daughter and I think winter would have been easier. I think i will just pass this on to my sister as it is. His dream of nirvana may not be yours. It’s nice to feel wanted but strange to get such a call out of the blue after many years. I like the sound of your fire and dogs better. Thanks Marie. It was a strange call. “Leaving laughing and wanting more” has always been my motto. That said, I’ll take my fire and dogs any day!! Time to change, live, encourage and reflect.